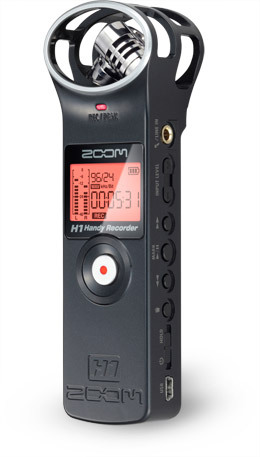 I was excited to pre-order the new Samson Zoom H1 portable Audio Recorder and posted this article. I received an email from the Pre-Order seller that the release date was pushed back to the August 20th. I completely trust the seller, but just to make sure everything was on the up and up I contacted Samson for an official comment. factory, and it had to be held back. We are deeply sorry about this. Thanks Samson for the fast response, and although i'm sad to say it won't be in my hands soon enough, i'm sure the delay is for good reason. Samson makes awesome products such as the Zoom H4n and unlike other companies claiming a release date Red Cameras or product availablity, they've always been on top of things. I expect these things to move fairly quickly, so if you're still interested in getting the pre-order, check out this article. Tweet this article, pass the word, spread the news. Zoom H1 has been delayed expected August 20th. Posted in DSLR Audio, Equipment Reviews, Videography Gadgets. Tags: delay, product release date, zoom h1 on July 27, 2010 by Emm. Just ordered my Zoom H1 from B&H Photo it is on its way expect my review on YouTube Yes! Oh it was like so nice to see that In Stock notification as my order went through and on to their warehouse. Oh UPS may God Speed! Zoom H1 is out Now In Stock? Just saw a pic click on my name to view it. Hoping this turns up on the August 20th... we will see! I emailed Samson directly, two different reps emailed back with August 20th. I followed up again and they still say Aug 20th. If you are talking about a retailer, this might mean they are getting a late batch? Well Amazon is showing a release date of Sept 8 for the Zoom H1 and anyone can post as some Zoom Guy but my direct sources are talking delay beyond August 20. Time will tell. Wow, flattered you'd stop by and comment on this tiny blog. Thanks Zoom Guy! August 20 remains the in-store date. We do not anticipate any delays... Thanks for your patience. And I can tell you, it is definitely worth the wait! I'll email Samson again and see what they say. I contacted Omnimedia the Canada release date for the Zoom H1 is now mid September will it ever show up bah!? Sweetwater is giving me Aug 22 as a new ship date on my pre-order. I'm so bummed. I got the same email from the ebay seller. Im glad to hear its the real deal. My first order update from Amazon stated a delivery date of August 24th. Just received a second update today giving me a delivery date of September 10th. Ugh.